SANTA CLARA, Calif. (AP) — Long before Nick Mullens took the field as an NFL quarterback, he prepared for the moment he’d play in a loud road stadium by downloading crowd noise and blaring it on his headphones as he practiced calling out plays in his apartment. “I’ve played in a lot of the most prominent stadiums in the country as far as college football goes,” said Mullens, who pointed to games in college at Nebraska, Alabama and LSU as the most challenging crowds he’s faced. 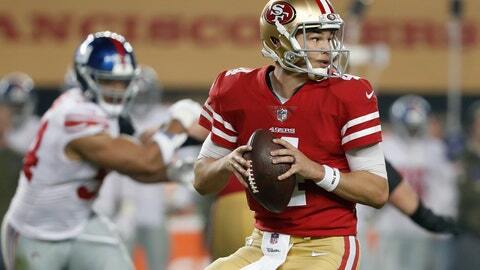 Mullens’ first road start for the 49ers (2-9) wasn’t a successful one. He went 18 for 32 for 221 yards with one touchdown, two interceptions and four sacks in a 27-9 loss to Tampa Bay last week. There were a handful of issues with hearing the play call from coach Kyle Shanahan in his helmet headset and Mullens had to rush to the sideline once to get the play and burn two timeouts on other occasions. NOTES: WR Marquise Goodwin remains away from the team to tend to an undisclosed personal matter. … C Weston Richburg (knee) and T Joe Staley (veteran) also missed practice, while DB D.J. Reed (foot) will miss the game this week.